Stack is a robust, multipurpose WordPress theme built with reuse and modularity at the core. Blending contemporary styling with exclusive page building, Stack forms the ideal starting point to website projects of any kind. 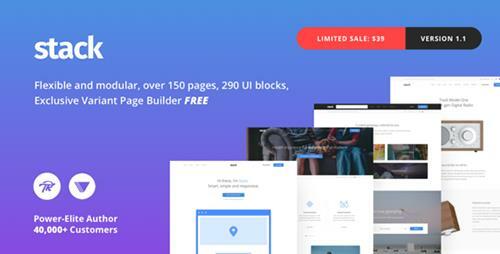 Boasting over 150 demo pages, 290 customizable interface blocks and a plethora of carefully crafted base elements. Stack is perfect for your Startup, Landing Pages, Corporate Sites, Agency Sites, Portfolio and so much more. Choose from Visual Composer or Variant Page Builder to craft your website with, both are included with Stack. Take Stack out for a spin and try our exclusive�admin demos, try the�Visual Composer version�or the�Variant Page Builder version�and decide how you�ll use Stack on your site.